Check out these ‘HIGH ENERGY’ REPEATING ROCK LICKS for more powerful guitar solos! We will be playing in the key of D minor using the scale shape of D minor pentatonic at the 10th fret. Technique tips to get your repeating licks sounding clean, punchy and powerful every time! So jump in and discover what repeating licks like these can do for your rock and metal solos! In this guitar lesson I’ll show you how to play 5 repeating rock licks and how you can slip them into your guitar solos and kick your guitar soloing up a gear. 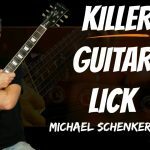 Guitar legends like Slash, Michael Schenker and Zakk Wylde use licks just like these to create their smoking guitar solos….now YOU can use them too. 0:15 Hear me solo using some of the repeating rock licks you’re going to learn in this lesson. You might recognise some of them from the playing of guitar legends like Slash, Randy Rhoads, Michael Schenker, Zakk Wylde and others! 1:04 All these repeating licks are in the key of D minor and use the D minor pentatonic scale and the D blues scale. Here you’ll learn both of these essential guitar scale shapes. Pretty much all the rock guitar legends play this repeating lick but Slash plays licks like this one a lot. It’ll sound great slipped into your rock solos! It uses a bend on the B string then a triplet hammer and pull off sequence on the high E and B string. Watch for the picking tips here – they can make it easier to speed the lick up as fast as you want. This lick is a favourite of Michael Schenker – but everyone plays it. It’s made up of a short 3 note sequence which we repeat 5 times. I like to alternate pick this repeating lick. Watch for the left hand muting tips to get the lick clean and fast! This lick is heard in the playing of Zakk Wylde and others! The lick uses the blues scale for a dark and edgy sound. It’s made up of 2 short 4 note fragments which we repeat 4 times each. Watch the picking for this and also experiment with the more left hand orientated approach I show you too. This takes a little practice but can help you hit the warp speed factor with this lick! This repeating rock lick uses the D blues scale and is played in sextuplet rhythm. I use my first 3 fingers to play this one – in fact it’s a great left hand legato practice exercise to help you develop finger independence in your fretting hand. Follow the palm muting guidelines here to get clean and sharp execution of this repeating rock lick. Another Zakk Wylde style lick! This lick uses the D blues scale but we’re reaching up and grabbing a few higher note as well. Practice adding these notes into some of your favourite minor pentatonic licks – you’ll be surprised at how many cool ideas you can discover! 15:18 What should you do with these repeating rock licks to get the most out of them and absorb them into your playing? I believe the most important thing is to practice not just playing them – but to practice USING them! Put on a backing track or drum loop and practice looping them around, getting them in time and sounding crisp and clear. Then practice improvising and slotting them into your playing with other stuff you’d normally play. Experiment to see how to make them work best and also try to create some repeating rock licks of your own based on these.